His younger brother and Bihar Opposition leader Tejashwi Yadav, 29, remained unmoved by the crisis in the family and addressed a rally of backward and extremely backward castes people in Patna. PATNA: The bitter drama unfolding in jailed RJD chief Lalu Prasad Yadav’s family turned murkier on Saturday as his elder son Tej Pratap Yadav remained firm on his decision to divorce his wife Aishwarya Rai and alleged that the arranged marriage was the result of some people deriving “political mileage”. “I was unwilling to marry at this point, but I was made a pawn. Many people did several things to derive political mileage. They hatched a conspiracy and made me a scapegoat… Even my sisters had supported my wish not to marry at this point, but some people forced my parents to get me married,” said the 30-year-old first-time RJD legislator and former health and environment minister. “I am a simple man and a very religious type. I visited Varanasi recently. But she is used to high society, has studied at Miranda House College, Amity University and BN College. 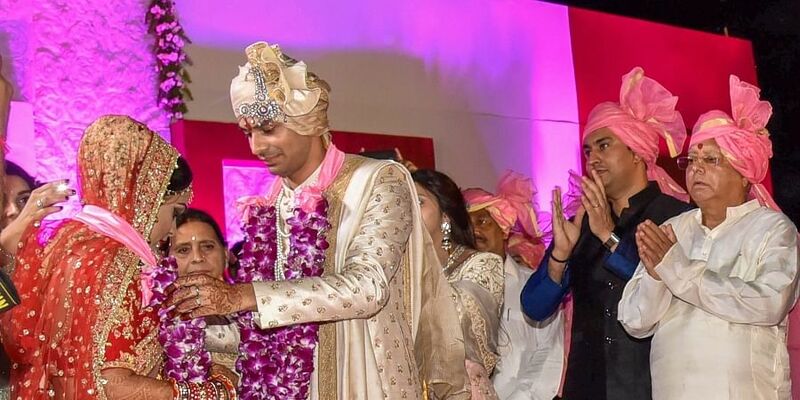 It (marriage) was a result of some people’s conspiracy to make me a pawn,” added Tej Pratap, who studied only up to class XII and ran a bike showroom before joining politics. “During our quarrels, she had herself asked me to divorce her... This had also happened in front of my father. Then I had also talked about it with my father over phone. But my own parents refused to consider my situation. I respected my parents’ wishes, but my own heart was broken,” he added. After meeting his father in Ranchi, Tej Pratap said: “My father’s health is not fine… Lalujee said he would come and discuss the matter with the family and relatives”. His younger brother and Bihar Opposition leader Tejashwi Yadav, 29, remained unmoved by the crisis in the family and addressed a rally of backward and extremely backward castes people in Patna. Hitting hard at CM Nitish Kumar and his ally BJP, Tejashwi said if the RJD-led Grand Alliance comes to power in Bihar, he would implement 69 per cent reservation on the lines of Tamil Nadu. Tejashwi refused to speak on his brother’s troubled marriage, saying it was a “private matter and there is no public interest in it”.